and workin' overtime. So original! I've been neglecting all my faithful readers out there, haven't I? The three of you will be happy to see that I've finally gotten around to updating. I have been keeping busy, but haven't felt the need to take pictures of anything I've been doing. I have a secret project that I will blog about next week, when it is no longer a secret. BUT - I have been doing some things that aren't a secret, too. 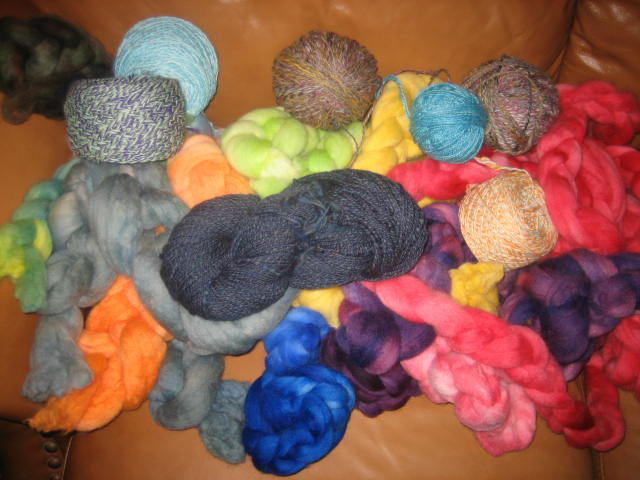 Like half the population of the world, I am thinking of starting an etsy shop, selling hand-dyed roving and hand-dyed handspun. Novel idea, brilliant. Try searching on etsy using the term "hand dyed roving" and see how many pages come up. I'm such a sucker, aren't I? But I spent the better part of the weekend playing with color, seeing what happens when you mix this, with this. Hmmmm. It was very entertaining. And I've been spinning my little heart out. I really, really enjoy spinning. I had restless leg syndrome (again) the other night, and because I had taken a sleep-aid, I was too tired to walk around to relieve the pain. So I spun. And it worked. I have a single treadle, but I used both feet, so one wouldn't go crazy while the other was treadling. These are the fruits of my labor. So far. I even went as far as to take all those frozen marigold blooms out of my freezer (and there were a lot!) and cook them down to dye some roving. Not too stinky, if I do say so myself. The smell and the results!! Here's the pot of blossoms cooking away, and here's what the roving looked like after it was dried. 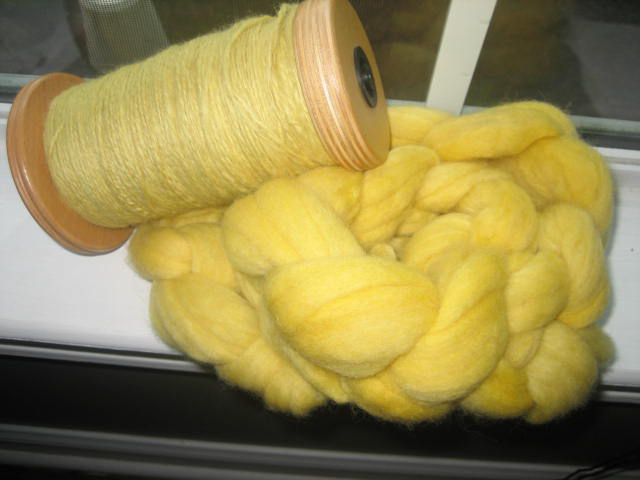 I used an alum mordant on the roving, and it came out bright yellow. Very pleasing to MY eye, if not yours. If you don't like yellow, don't use marigolds. 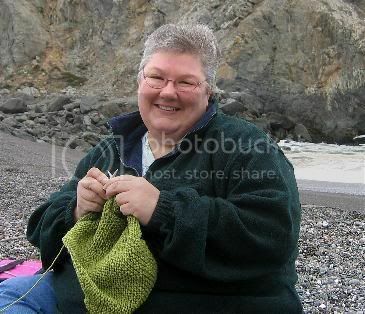 The yarn on the bobbin was from my first batch, a few weeks ago. I didn't have any alum, so I tried baking soda, and then vinegar. Not together, I didn't want to recreate any volcano science experiments. The color is much more muted, with a greenish tinge. They say you can also use just the leaves of the marigold plants to dye with, too. A word to the wise though, once you start picking the blossoms and freezing them, your plants will go crazy. My garden looks like all I'm growing is marigolds. They LOVE to be picked! On to other things, I was cooking supper for my sweet husband last night, and I needed my can opener. I keep my utensil turntabout on top of my fridge, so I reached up and twirled to find the opener. Imagine my surprise (my screams are still echoing through the town) when this peeped out at me. 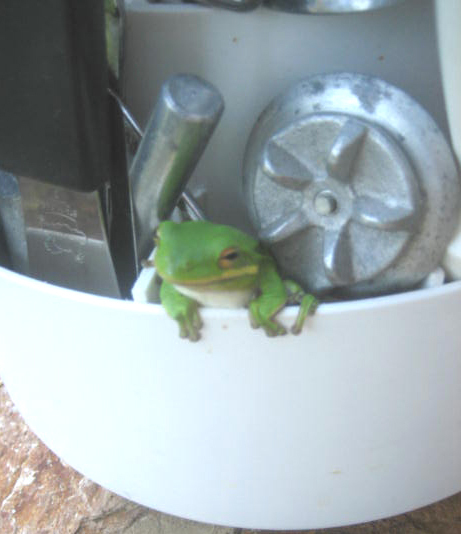 I'm not afraid of frogs or anything, but I sure as hell didn't expect to see one looking out at me from amidst my cooking stuff. John heard me and came running out to see who was killing me, and all I could do was point to the fridge. We both starting laughing at how stupid I looked. He could have been laughing at the frog, but I doubt it. We took it outside for a better view, and of course, to let it go. I thought I heard a cricket in the house the other night - I wonder if it was the frog? Here's my question to all of you - how in the hell did this thing get into my house, then into my turntable on top of the fridge? We have a screened-in back porch, which sits about 3 feet off the ground. The little sucker had to do some serious travelling to get where he did. And we have a cat, a fairly mean cat. Apparently a very lazy one, too! 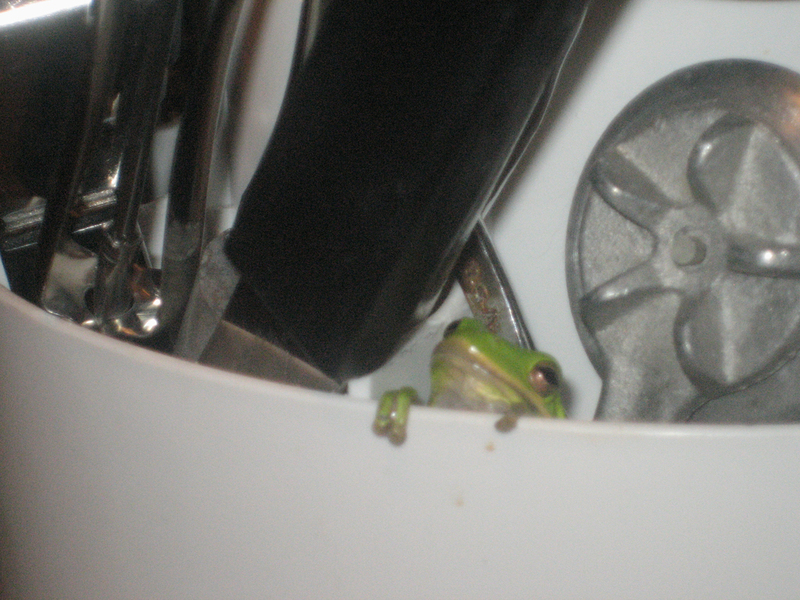 oh wow, that is so unexpected to find that frog on top of the fridge with your utensils!! I can just imagine you now, freaking out, getting red in the face, then laughing about it! Sheeze, Louise! Call me when you're going to have that much fun! 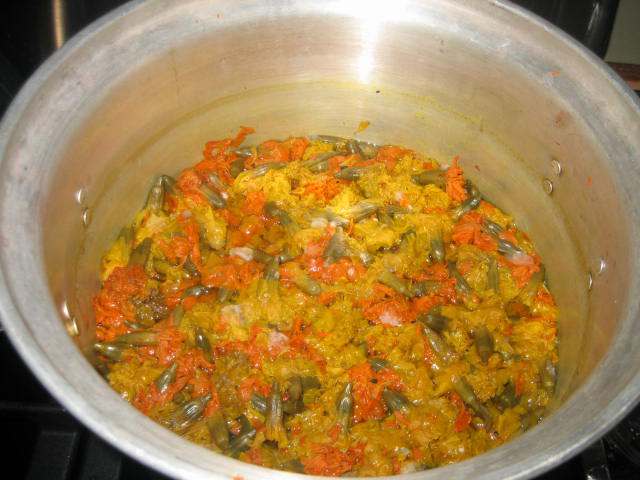 Boiling marigolbgdvfb(oops! kitty help), dying wool, c'mon! Share the fun!! Better you than me! I would've had a coronary if the frog had peeked out at me. I'm terrified of them. 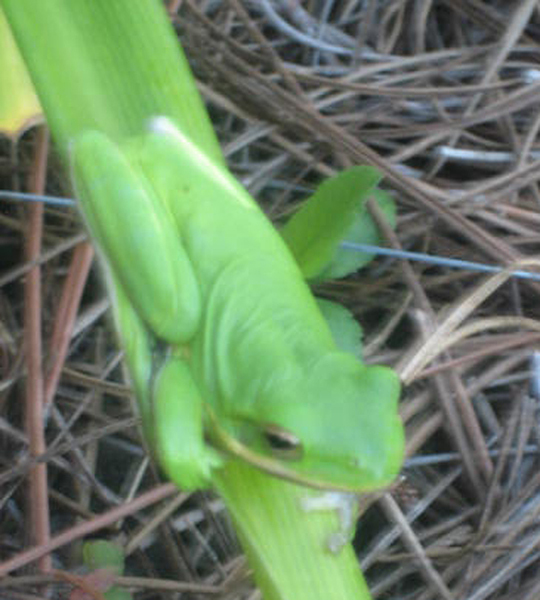 I've seen several tree frogs this year on the house. I wonder where they are coming from. the frog is too cute! and i love that pale yellow roving.